…heading off into the sunset. 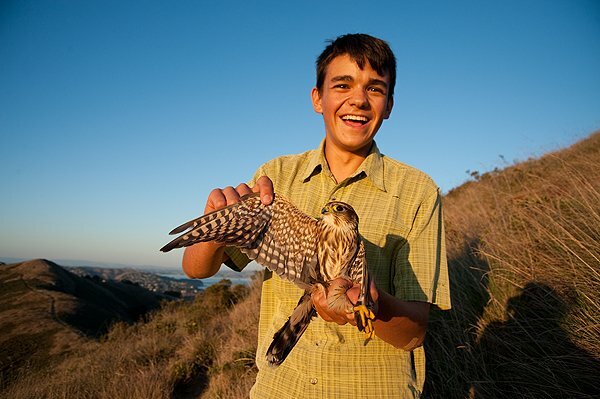 These birds are a rare treat but happily we have been banding more of them in recent years. They are often full of attitude and rightly so. Their fierce tendency to bite means the bander is often as relieved as the bird is when they finally part company. Here is another shot of a Merlin returning to the wild blue. It really is a privilege to be a part of this work. This is from an earlier time in my banding career. 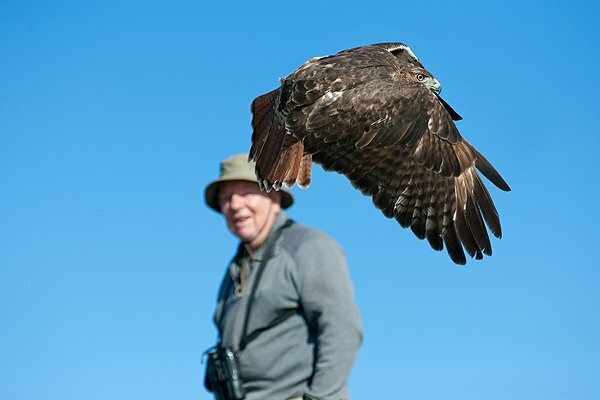 Red-tailed Hawks tend to be as calm as you are in your handling of them. Mutual respect is key, although as I write this I realize that one-sided respect is what’s actually called for. 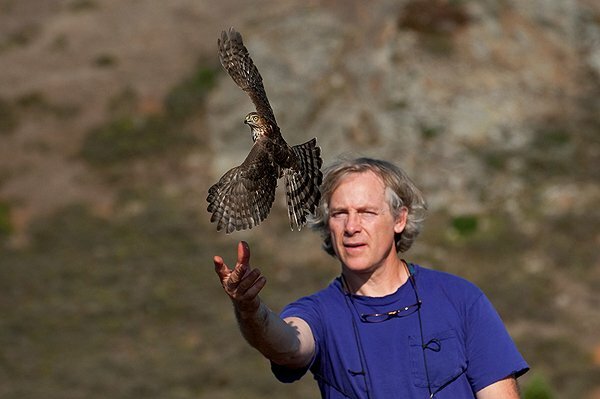 Respect the birds and do all that you can for them… that’s why we are out there in the first place. 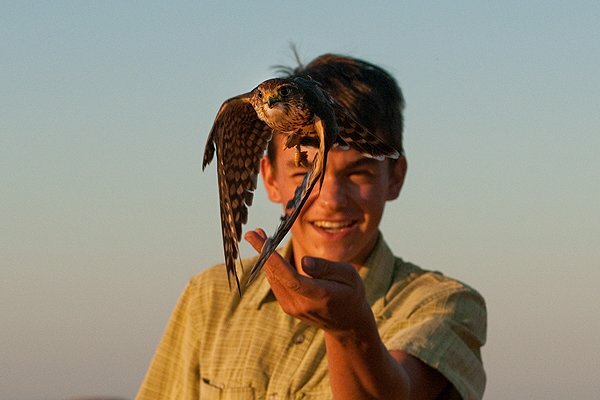 The birds have every right to hold me in the deepest contempt but I have seen the positive effects and wealth of knowledge this research brings; knowledge which can help individual birds as well as help shape and inform larger conservation policies. 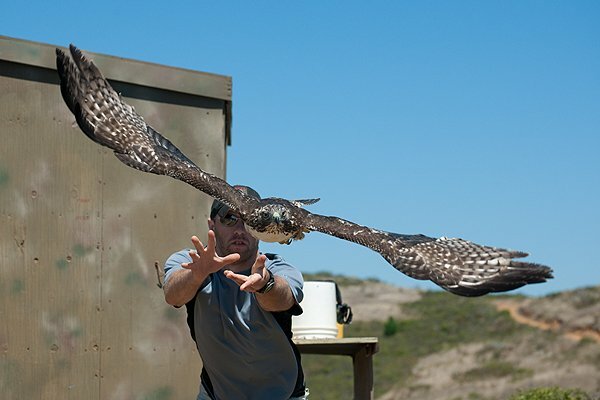 Redtails make for some dramatic release photos. They also make for poetic release photos. You never know how each shot will turn out which is one of the reasons I love documenting these moments. 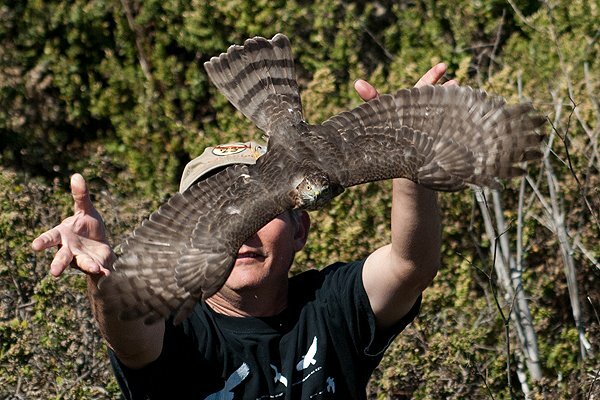 An adult Redtail, newly banded, heads toward the Golden Gate Bridge. 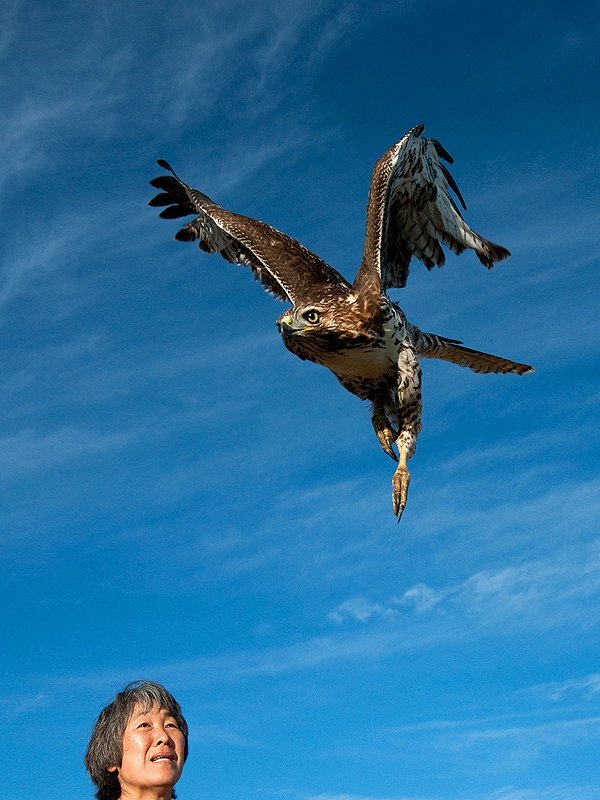 This Sharp-shinned Hawk is doing its best impression of a Redtail as it sweeps its wings wide on the downstroke. We see many more accipiters than buteos but the fact that they are more common makes them no less spectacular. Another Sharpie back to the wild. This moment of human/bird interaction is a beautiful and fleeting occurrence. It symbolizes an attempt to counter the ills of the past and to contribute to the well being and success of these species. It wasn’t too long ago when hawks were being shot for sport, and sadly “found shot” is still being reported during band recoveries. 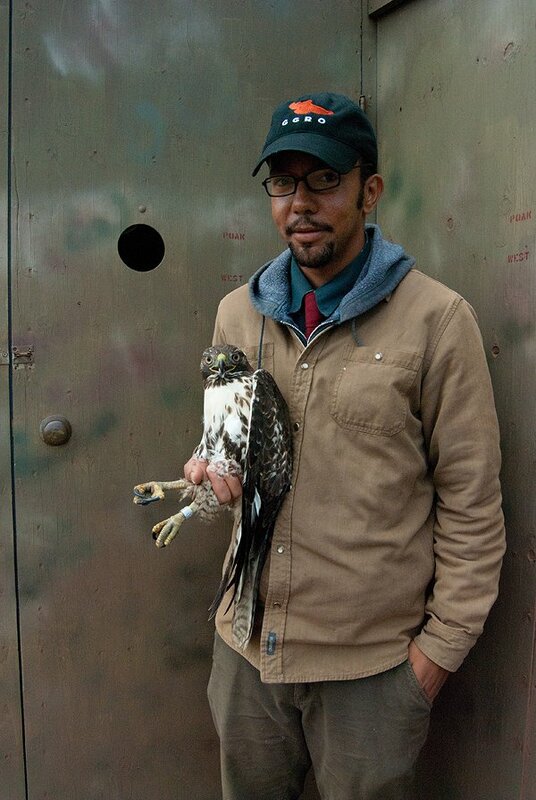 I’m honored to be part of a research tradition that is ever evolving, centered on the welfare of the birds, and prides itself on competence and technical merit. Birds rule. I’m glad to be able to contribute and have my life immeasurably blessed in turn. Powerful shots, powerful commentary! Birds rule, indeed. The necktie is good for distracting merlins when they want to bite. 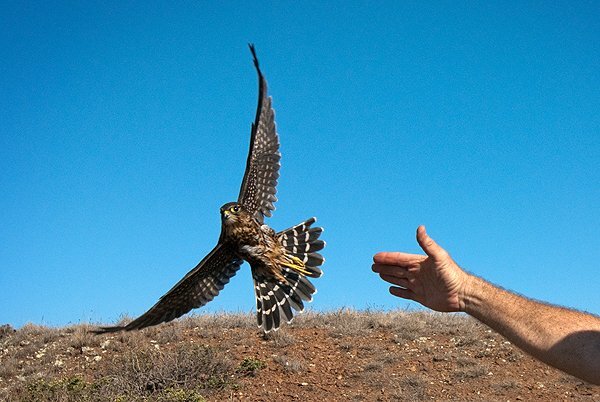 Gorgeous photos and a wonderful insight into banding raptors! This is a truly powerful series of photos. Thanks for sharing Walter!